Products Introductions / What is the difference between ceramic and vitrified ceramic tiles? One of the most important practical considerations when choosing tiles is whether or not you choose a ceramic or vitrified ceramic tile. So what is the difference? Let’s take a look. Ceramic tiles are made of clay – along with added certain minerals and solvents – that has been baked or fired in a kiln at extremely high temperatures. This process is essential for setting and hardening the clay part of a tile, known as the biscuit, as well as the glaze on the tile. The glaze is basically an added layer of liquefied glass applied to the top of a tile before firing. Once baked, the glaze adds strength and waterproofs the top surface of the tile. Not all ceramic tiles are glazed though – they are available as glazed and non-glazed. Without the glaze, ceramic tiles are less water resistant and have a rough texture. 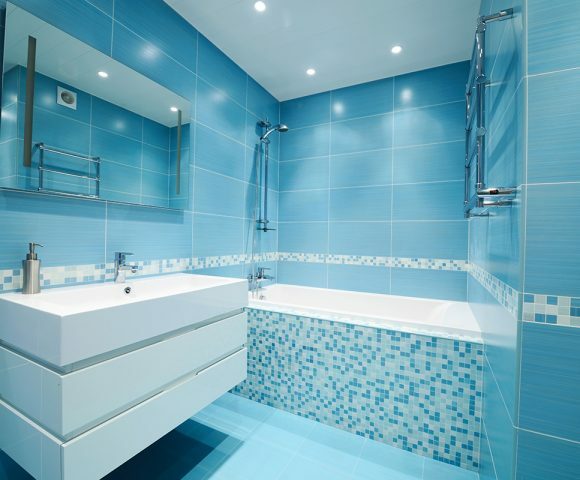 Glazed ceramic tiles are great for bathrooms and other wet areas in residential spaces. What are vitrified ceramic tiles? Vitrified tiles are a very strong, smooth, glassy type of ceramic tile with extremely low porosity. This means they don’t absorb water. The term “vitrify” refers to the process of making a glass or glass-like substance via heat and fusion. Vitrified tiles are made of a mixture of 40% clay and 60% silica which results in an almost glass-like tile that typically has a water absorption rate of 0.5% or less. With this level of water absorption, vitrified tiles may not need glazing. However, there are different classifications of porosity in vitrified tiles ranging from non-vitreous & semi-vitreous (most absorbent) to vitreous & impervious (least absorbent). Vitrified tiles last ages, and have scratch, stain & abrasion resistant qualities, which make them a more durable option for corporate, commercial and residential buildings – indoor and outdoor – with high traffic areas.